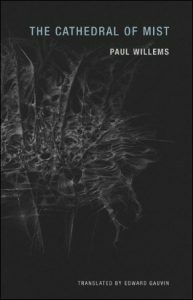 In this collection of surreal, exquisitely-composed and expertly-translated stories, Belgian fantasist Paul Willems (1912-1997) offers us a multitude of dreamscapes both as delicate as gossamer and tangible as a mountain. Cathedrals made of mist, palaces of emptiness, dreams that melt into reality: you’ll find all of these within the six stories included in the slim volume (two essays about reading and writing are included at the end). Form and content work in harmony in a way that I’ve rarely encountered, with Willems lingering on language in a loving way that makes sense once you read the essay “Reading” (a peaen to his deep love of literature and literary creation). In the most disturbing story of the collection, “The Palace of Emptiness,” Willems sketches an architect who, driven by grief over the deaths of his parents and his violent separation from his wife, draws plans (on the walls of his house) for a structure void of a soul. The references to the husband and wife’s emerging sadistic and masochistic impulses leave the reader haunted by this terrifying kind of emptiness. Drawn from incidents and reflections Willems noted in his diary over the course of his life, the stories in The Cathedral of Mist reveal a writer obsessed with liminal states, literature being one of them. After all, a book itself is tangible, but the words on the page exist on multiple levels- on the page, in our minds, in our dreams and fantasies. Language evokes that which we cannot capture. As Willems explains in “Writing” (originally given as a lecture), “to write is also to name. An act of faith, ever frustrated. The hoped-for horizon is never reached, or even drawn near, and what we think we grasp fades away the very moment we give it a name. If illusions were not indefatigable, we would no longer write” (77).